A recipe for Honey Roasted Peanut Butter Pound Cake. 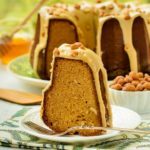 It is a dense cake filled with honey roasted peanuts and topped with a peanut butter glaze. Preheat oven to 325 degrees F. Grease and flour a 12-cup bundt or pan. Whisk together flour, baking powder, salt, and baking soda in a medium bowl. Cream peanut butter and butter in a large bowl. Add sugar and beat until light and fluffy. Add honey and beat to combine. Add flour mixture and beat until just combined (do not over-mix). Stir in peanuts. Pour and spread batter evenly in prepared pan. Bake for 1 hour, 20 minutes, or until a toothpick or cake tester inserted in the center comes out clean. Check cake at 1 hour. If browning too quickly on top, loosely cover cake with aluminum foil (place foil on top and do not seal edges). Cool cake in the pan for 12 minutes. Remove cake from the pan and cool completely on a wire rack. Whisk together confectioners sugar, peanut butter, vanilla, salt, and milk until smooth. Add more milk if needed for desired consistency. Drizzle glaze over cake. Sprinkle chopped peanuts on top of cake.